3-George Arthur Walker was born on 7 Jun 1879 in Westbury, Tasmania and died on 31 Jul 1951 at age 72. 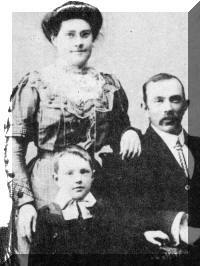 George married Anne Maria Cox, daughter of Joseph Cox and Agnes Wilson, on 26 Apr 1905 in Parkham, Deloraine. Anne was born on 6 Dec 1884 in Parkham, Deloraine, died on 8 Jun 1959 at age 74, and was buried in Jun 1959. George only a year or so of schooling at a private school at Exton, run by a Miss Kingston. At the age of twelve he went to work on a farm at Blackemoor, now called Weegena. He married Annie Cox of Parkham. Her sister Minnie married George's brother, Herbert. At that time he was working for Mr. Alan Badcock at Exton and lived in a cottage on the property. Later they moved to a house at Exton where they had a shop and then George had a butcher's business and also a truck which he used for carting goods to Launceston. He was an active member of the Methodist church at Exton and a trustee for a number of years. George and Annie had a son, Ray, and a daughter, Peace. George died on 31st July, 1951 and Annie 8th June, 1959. 4-Raymond Clifford Walker was born on 8 Jul 1907 in Exton, Tasmania, died on 15 Jun 1979 in Deloraine, Tasmania at age 71, and was buried on 17 Jun 1979 in General Cemetery, Deloraine, Tasmania. He served in the Second World War. Raymond married Ivy May Loone, daughter of Gilbert Loone and Bernice Trethewie, on 6 Jul 1929 in Methodist Church, Exton. Ivy was born on 9 Nov 1908 in Beulah, Tasmania, died on 30 Jun 1981 in Deloraine, Tasmania at age 72, and was buried on 1 Jul 1981 in General Cemetery, Deloraine, Tasmania. They had eight children: Gilbert George, Frederick John, Winifred Bernice, Clifford Arthur, Trevor Charles, Dorothy May, Helen Faye and Michael James. 5-Gilbert George Walker was born on 6 Apr 1930. Gilbert married Betty Radcliffe. They had four children: Peter George, Raymond John, Michelle Anne Marie and Leigh. 6-Peter George Walker was born on 23 Dec 1952. Peter married Kathy Heatley. They had two children: Derek Leigh and Kim Maree. 7-Derek Leigh Walker was born on 12 Nov 1976. 7-Kim Maree Walker was born on 3 Feb 1981. 6-Raymond John Walker was born on 14 Jun 1956. Raymond married Monica Ann Rose. Monica was born on 1 Aug 1959. Raymond next married Heather. They had three children: Joshua, Jacob and Lillian. 6-Michelle Anne Marie Walker was born on 7 Dec 1965. Michelle married someone. She had one daughter: Jacqueline Anne. 7-Jacqueline Anne Walker was born on 23 Nov 1983. 6-Leigh Walker was born on 17 Aug 1973. Leigh married Heather. Gilbert next married Bernice Warren. 5-Frederick John Walker was born on 28 Dec 1931 in Deloraine, Tasmania and died on 7 Apr 1999 in St. Helens at age 67. 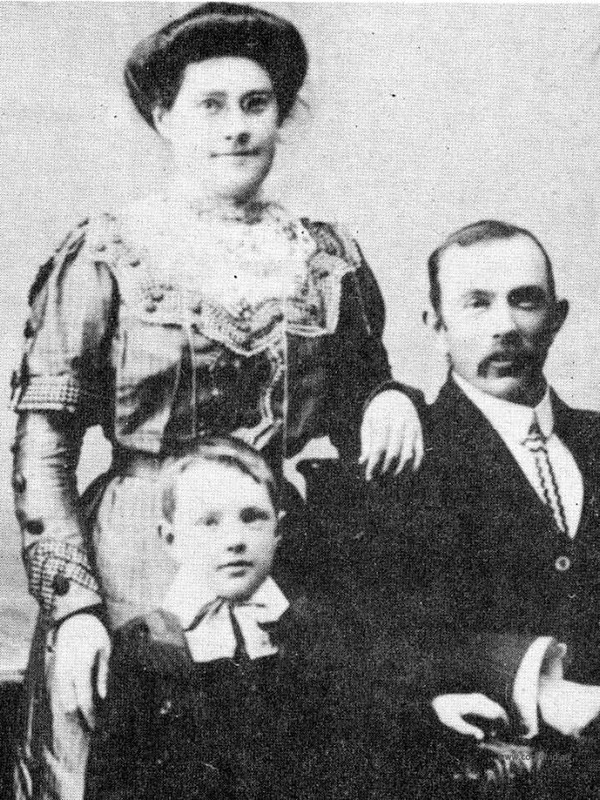 Frederick married Shirley Boon. Shirley was born on 16 Feb 1929. They had three children: Garry John, Tony Dallas and Ivan Cyril. 6-Garry John Walker was born on 25 Apr 1952. Garry married Julie Anne Gleeson. Julie was born on 21 Apr 1954. They had two children: Christopher John and Kylie Anne. 7-Christopher John Walker was born on 17 Aug 1976. 7-Kylie Anne Walker was born on 6 Aug 1978. 6-Tony Dallas Walker was born on 14 Oct 1953. Tony married Shirley Anne Rootes, daughter of Kenneth Frank Rootes and Ailsa Gwendoline Stebbing, on 28 Sep 1974 in Westbury, Tasmania. Shirley was born on 3 Oct 1955 in Scottsdale. They had three children: Yvette Louise, Fred and Adam Troy. 7-Yvette Louise Walker was born on 24 Oct 1975 in Launceston. Yvette married Shaun Matthew Edwards on 21 Nov 1998 in Launceston. 7-Fred Walker was born on 4 Aug 1977 in Launceston and died on 4 Aug 1977 in Launceston. 7-Adam Troy Walker was born on 23 Sep 1978 in Launceston. Adam married Kathryn Rachelle Barker. They had one daughter: Harley Rose. 8-Harley Rose Walker was born on 16 Dec 1999 in Launceston. 6-Ivan Cyril Walker was born on 14 May 1957. Ivan married Pam Keitha Clark. Pam was born on 26 Mar 1960. They had two children: Simon Clark and Andrew Lee. 7-Simon Clark Walker was born on 18 Sep 1981. Simon married Rachael Styles. 7-Andrew Lee Walker was born on 30 Sep 1983. 5-Winifred Bernice Walker was born on 15 Nov 1933 in Sister Harvey’s Hospital, Deloraine. Winifred married Joseph Ronald Parsons on 5 Jan 1952 in Methodist Church, Exton. Joseph was born on 10 Jan 1932 in Nurse Stone's Nursing Home, Deloraine. They had three children: Wendy Merrianne, Robert Joseph and Anthony Raymond. 6-Wendy Merrianne Parsons was born on 30 Jul 1952 in Arcoona Hospital, Deloraine. Wendy married Adrian Currant on 21 Oct 1973 in Methodist Church, Caveside. Adrian was born on 19 Jul 1950 in George Town, Tasmania. They had two children: Aneak Maree and Cameron Scott. 7-Aneak Maree Currant was born on 8 Apr 1977 in Queen Victoria Maternity Hospital, Launceston. Aneak married Philip Matthew Smith on 25 Nov 1995 in Lobster Creek, Caveside, Tasmania. Philip was born on 8 May 1975 in Queenstown, Tasmania. They had two children: Joshua Mathew and Brooke Maree. 8-Joshua Mathew Smith was born on 12 Jun 1996 in Queen Victoria Maternity Hospital, Launceston. 8-Brooke Maree Smith was born on 4 Dec 1998 in Queen Victoria Maternity Hospital, Launceston. 7-Cameron Scott Currant was born on 31 May 1979 in Queen Victoria Maternity Hospital, Launceston. Cameron married Lisa Ann Donald. Lisa was born on 6 May 1979 in Deloraine, Tasmania. They had two children: Katie Mabel Ellen and Bradley Scott. 8-Katie Mabel Ellen Currant was born on 21 Jan 1999 in Queen Victoria Maternity Hospital, Launceston. 8-Bradley Scott Currant was born on 20 Dec 2000 in Queen Victoria Maternity Hospital, Launceston. 6-Robert Joseph Parsons was born on 2 Jul 1954 in Arcoona Hospital, Deloraine. Another name for Robert is Bobby. Robert married Valerie Dawn Davies in St Marks Church, Deloraine. Valerie was born on 30 Apr 1957. They had two children: Erica May and Ross Ronald. 7-Erica May Parsons was born on 4 Nov 1976 in Mersey General Hospital, Latrobe. Erica married someone. She had one daughter: Claudia Hazel. 8- Claudia Hazel was born on 13 Jun 1998. 7-Ross Ronald Parsons was born on 21 Mar 1978 in Mersey General Hospital, Latrobe. Ross married Zilka Becke. Zilka was born in Germany. 6-Anthony Raymond Parsons was born on 21 Dec 1955 in Arcoona Hospital, Deloraine. Anthony married Desley June Clark in Gospel Chapel, Deloraine, Tasmania. Desley was born on 1 Jun 1961 in Irian Jaya. They had six children: Mathew Joseph, Elizabeth Helen, Jonathon, Suzanna, Emily and Ruby. 7-Mathew Joseph Parsons was born on 1 Mar 1984 in Longreach, Queensland. 7-Elizabeth Helen Parsons was born on 4 Oct 1985 in Longreach, Queensland. 7-Jonathon Parsons was born on 25 Jun 1987 in Longreach, Queensland. 7-Suzanna Parsons was born on 27 Oct 1989 in Mersey General Hospital, Latrobe and was christened on 27 Oct 1989 in Mersey General Hospital, Latrobe. 7-Emily Parsons was born on 10 May 1992 in Launceston. 7-Ruby Parsons was born on 16 May 1994 in Launceston. 5-Clifford Arthur Walker was born on 11 Apr 1939 in Arcoona Hospital, Deloraine. Clifford married Patricia Lorraine Ellings. Patricia was born on 25 Feb 1942. They had two children: Kareena Lorraine and Stephen Clifford. 6-Kareena Lorraine Walker was born on 5 Oct 1963. Kareena married Renato Zancheta. They had three children: Antonio, Dillon and Bianca. 6-Stephen Clifford Walker was born on 17 Jun 1965. Stephen married Alysha. They had three children: Sarah, Lyndon and Alexander. 5-Trevor Charles Walker was born on 8 Feb 1943 in Arcoona Hospital, Deloraine and died on 14 Apr 1944 in Launceston at age 1. 5-Dorothy May Walker was born on 6 Mar 1945 in Arcoona Hospital, Deloraine. Dorothy married Norman Leonard Smith on 18 Nov 1961 in Methodist Church, Exton. Norman was born on 6 Mar 1939 in Ulverstone, Tasmania. They had five children: Richard John, Norman Charles, Lindy Anne, Timothy Paul and Kelly Maree. 6-Richard John Smith was born on 19 Sep 1962 in Leven Bank Hospital, Ulverstone. Richard married Venna Rhene. 6-Norman Charles Smith was born on 20 Oct 1963 in George Town, Tasmania. Norman married Debra Bridget Watson on 18 Sep 1993 in City Park, Launceston, Tasmania. Debra was born on 13 Feb 1966 in Tasmania. 6-Lindy Anne Smith was born on 10 Jun 1965 in George Town, Tasmania. Lindy married David Peter Read. David was born on 24 Aug 1969 in Launceston. They had two children: Morgan Sarah Elizabeth and Olivia Mary. 7-Morgan Sarah Elizabeth Read was born on 25 Aug 1995 in Queen Victoria Maternity Hospital, Launceston. 7-Olivia Mary Read was born on 20 Feb 1997 in Latrobe. Lindy next married Vern Ahrent. They had one son: Benjamin Jade. 7-Benjamin Jade Ahrent was born on 22 Dec 1984. 6-Timothy Paul Smith was born on 13 Sep 1966 in George Town, Tasmania. Timothy married Carol Ann Davies on 8 Nov 1997 in Devonport. Carol was born on 11 Feb 1965 in Queenstown, Tasmania. They had two children: Mikayla Anne and Daniel Jaden. 7-Mikayla Anne Smith was born on 27 Feb 1997 in Latrobe. 7-Daniel Jaden Smith was born on 5 Sep 1999 in Queen Victoria Maternity Hospital, Launceston. 6-Kelly Maree Smith was born on 11 Aug 1973 in Queen Victoria Maternity Hospital, Launceston. Kelly married Warren John Hill on 15 Dec 2001 in Launceston. Warren was born on 8 Mar 1972 in Western Australia. They had three children: Tiernan James, Alexander Joel and Piper Mae. 7-Tiernan James Hill was born on 6 Mar 1991 in Queen Victoria Maternity Hospital, Launceston. Another name for Tiernan is Ty. 7-Alexander Joel Hill was born on 9 Apr 1997 in Queen Victoria Maternity Hospital, Launceston. 7-Piper Mae Hill was born on 9 Oct 2001 in Queen Victoria Maternity Hospital, Launceston. 5-Helen Faye Walker was born on 9 Apr 1947 in Arcoona Hospital, Deloraine, died on 1 Feb 1999 in the Launceston General Hospital at age 51, and was buried on 4 Feb 1999 in Carr Villa Cemetery, Launceston in A13/69. Helen married Herbert John Jones. Herbert was born on 2 Jan 1943. They had three children: Christopher John, Tamara Louise and Mark Raymond. 6-Christopher John Jones was born on 18 Jul 1964 in Queen Victoria Maternity Hospital, Launceston. Christopher married Debra Grace. They had two children: Emma and Joshua. 6-Tamara Louise Jones was born on 13 Nov 1969 in Queen Victoria Maternity Hospital, Launceston. Tamara married someone. She had one son: Zane. 6-Mark Raymond Jones was born on 11 Jun 1972 in Queen Victoria Maternity Hospital, Launceston. Mark married Judy. They had one son: Dillon. 5-Michael James Walker was born on 15 Nov 1948 in Arcoona Hospital, Deloraine. Michael married Beverley Francis. Beverley was born on 6 Jan 1947 in Sister Murphy's Home, Deloraine. They had three children: Glen Raymond, Mathew Paul and Kathryn Michelle. 6-Glen Raymond Walker was born on 28 Jan 1973 in Burnie, Tasmania. Glen married Kylie Maree Noble about 1997 in 10 Home Street, Launceston, Tasmania. They had one son: Cody Jack. 7-Cody Jack Walker was born on 17 Jan 1996. 6-Mathew Paul Walker was born on 28 Feb 1975 in Queen Victoria Maternity Hospital, Launceston. 6-Kathryn Michelle Walker was born on 20 Mar 1982 in Queen Victoria Maternity Hospital, Launceston. 4-Peace Louise Walker was born on 28 Jun 1919 in Exton, Tasmania, died about 1992 in Hobart, Tasmania aged about 73, and was buried in St Marys Church of England, Hagley. Peace married Trevor Adye Scott, son of Adye Alexander Scott and Stella May Singline. Trevor was born on 23 Jul 1917 in Queen Victoria Maternity Hospital, Launceston, died on 27 Sep 1973 in Hobart, Tasmania at age 56, and was buried in St Marys Church of England, Hagley. They had three children: Warren Trevor, Valerie Joy and Kelvin Adye. 5-Warren Trevor Scott was born on 12 Jan 1941. Warren married Valerie Rushton. Valerie was born on 17 Apr 1942. They had one son: Sean Duane. 6-Sean Duane Scott was born on 18 Aug 1966. Warren next married Claudia Broomhall. Claudia was born on 31 Aug 1951. They had one daughter: Sonya. 6-Sonya Scott was born on 30 Sep 1976. 5-Valerie Joy Scott was born on 8 Jul 1942. Valerie married David Stoddard. David was born on 12 May 1941. They had three children: David Stuart, Brett Anthony and Jacqueline Louise. 6-David Stuart Stoddard was born on 7 Mar 1967. 6-Brett Anthony Stoddard was born on 10 Apr 1969. 6-Jacqueline Louise Stoddard was born on 22 Oct 1972. 5-Kelvin Adye Scott was born on 6 May 1950 and died on 28 May 1988 at age 38. Kelvin married Anne Mary Gilligan. Anne was born on 19 Sep 1951. They had four children: Trevor Damien, Kelly Marie, Catherine Ann and Megan Louise. 6-Trevor Damien Scott was born on 21 Sep 1974. 6-Kelly Marie Scott was born on 26 Mar 1976. 6-Catherine Ann Scott was born on 9 Sep 1978. 6-Megan Louise Scott was born on 30 Aug 1982 and died on 30 Sep 1982.